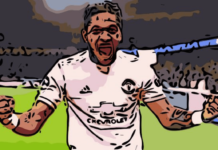 Tactical Analysis: Does Chris Smalling deserve £120,000 a week? Home Analysis Player Analysis Does Chris Smalling Deserve A £120,000 Per Week New Contract? Does Chris Smalling Deserve A £120,000 Per Week New Contract? With a slew of top Manchester United stars due to renew their contracts at the end of the season, it appears Chris Smalling will be the next Red Devil to put pen to paper. However, his reported new wages may be enough to bring a tear to the eye of any United fan. Reports suggest the 28-year-old will receive a three-year extension to his contract, which will see him earn £120,000 per week. Mourinho reportedly believes Smalling has earned a £40,000 per week pay rise, though is still desperate to bring in more defensive reinforcements in January. Other players whose contracts are due for renewal include Anthony Martial, Juan Mata, David De Gea and more, all of whom are players I’m sure a lot of fans would rather be tied down to new deals first. 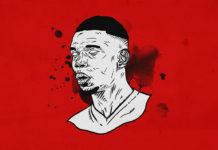 Nevertheless, in this tactical analysis, we’ll assess if Chris Smalling is befitting of his rumoured mammoth new deal. Fans would be forgiven for forgetting that’s it’s been a staggering eight years since Fergie brought in a baby-faced Chris Smalling from Fulham. Since then, it’s proven to be a troublesome spell for the England international. While Smalling has enjoyed several spells as a consistent figure in United’s defence, he’s struggled to bring consistency in terms of form to the matchday squad. The 2015/16 season was one that saw Smalling revered the most by critics. These glimpses of consistency partnered by the acquisition of Eric Bailly the following summer appeared to be the aid for United’s long-term defensive woes. However, as many fans today will argue, these woes are still yet to be addressed. After a season of constant rotation in centre-back partnerships last year, it appears Jose has established his favoured pairing. Smalling has started alongside Victor Lindelof in 11 matches so far this season across all competitions. On paper, the pairing makes sense. Lindelof is more of a composed, ball-playing centre-half, with neat tackling and interceptions. Meanwhile, Smalling poses more of a physical threat, key in both defending and attacking set-pieces. Nevertheless, United’s defence still simply isn’t good enough. When comparing Smalling’s statistics with those of other centre-halves in the Premier League, it’s clear to see the 28-year-old struggles to keep up. Even against United team-mate, Victor Lindelof, Smalling comes out worse off in nearly every parameter. In terms of tackles won per 90 metrics, Smalling manages 0.7, while Lindelof edges him out with 0.77. However, it’s Liverpool‘s Virgil van Dijk who come out on top with 0.86 tackles won per 90 metrics. Next, Smalling’s shoddy skills in possession come to the fore with just 0.1 take-ons won per 90 metrics. 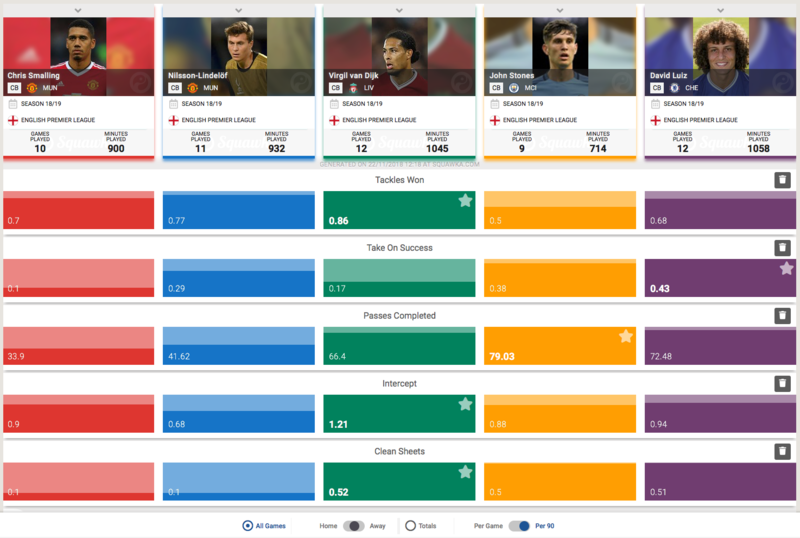 His more composed United compadre, as expected, edges him out with 0.29 successful take-ons per 90 metrics. However, it’s actually Chelsea’s David Luiz who comes out on top. Thanks to his aggressive defensive style, even in possession, Luiz manages a tally of 0.43 successful take-ons per 90 metrics. 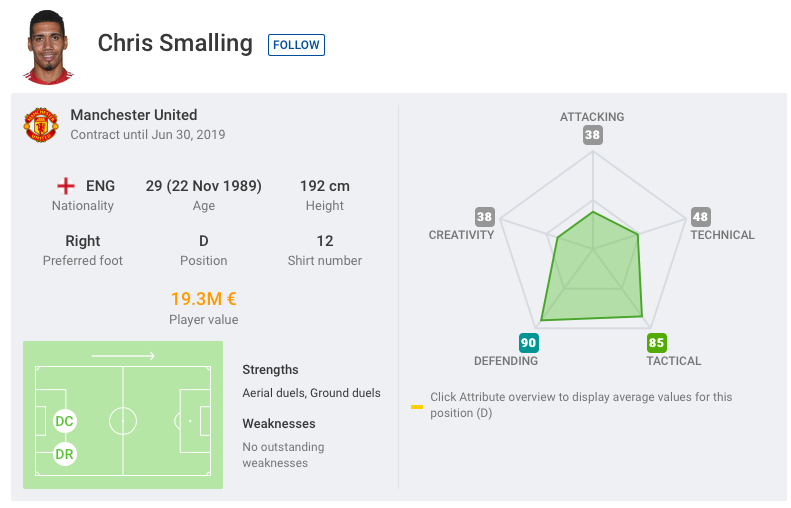 Next, again, Smalling’s lacklustre ability on the ball is apparent in the number of successful passes he has averaged per 90 metrics so far this season. Smalling has tallied 33.9 successful passes, while John Stones, a defender whose ball-playing ability is his most-valued asset, comes out on top with 79.03. However, it’s important to note the varying styles of play both Stones and Smalling play under. Pep Guardiola’s Manchester City have received mass praise for their build-up play, especially from the back. 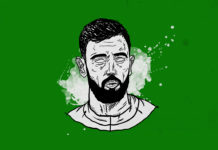 Meanwhile, Manchester United’s style involves a heavy focus on defensive solitude, leaving very little room for expressive football outside the attack and some of the midfield. Finally, the one statistics that perfectly outlines Manchester United’s defensive struggles this season comes in the form of clean sheets. Smalling has managed just one clean sheet in 10 appearances in the Premier League this season, the same can be said for Victor Lindelof. Meanwhile, each of Van Dijk (0.52), Stones (0.5), and David Luiz (0.51) are extremely close in their statistics. However, it’s the Dutchman who leads the pack, which is a testament to how much his arrival has helped Jurgen Klopp to stabilise his side’s defence. 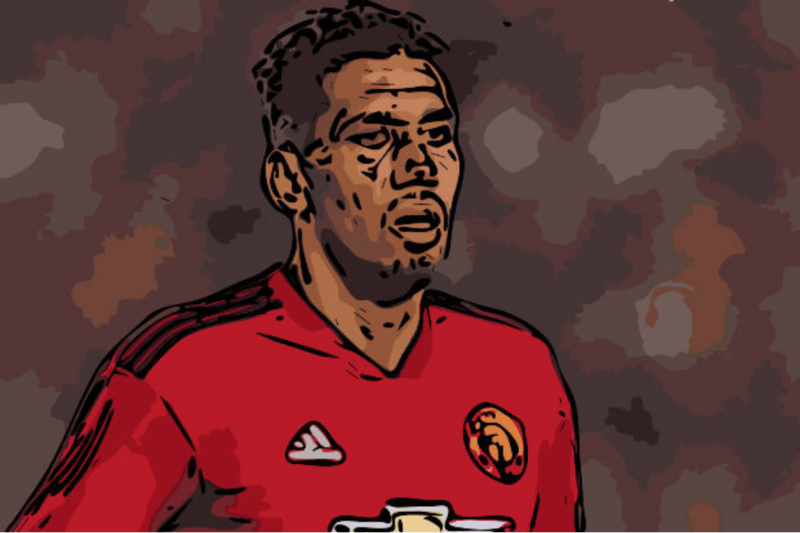 To conclude, it can certainly be argued that Chris Smalling’s new contract is more of a token to reward him of his long-term service to the club, rather than his actual performances. Other players are certainly more worthy of the same – if not, higher – wages, and that could create a rift between United’s board and the players themselves if they do not agree on terms. Smalling’s wages could mean inbound players looking to take his place will, in fact, demand a more lucrative wage slip. However, if there’s one thing you can count on United for, it’s giving players what they want financially – and then some. If you love tactical analysis, then you’ll love the new magazine from totalfootballanalysis.com – 118 pages of pure tactical analysis covering topics from the Premier League, Serie A, La Liga, Bundesliga and many, many more. Get your copy today for just £4.99 here! Previous articleWhy is Jesse Lingard Manchester United’s square peg? Next articleDo Manchester United Need Marko Arnautovic? 21-year-old football fan. Freelance writer and broadcast journalist, currently studying for a BA in Journalism (BJTC accredited) at the University of South Wales.